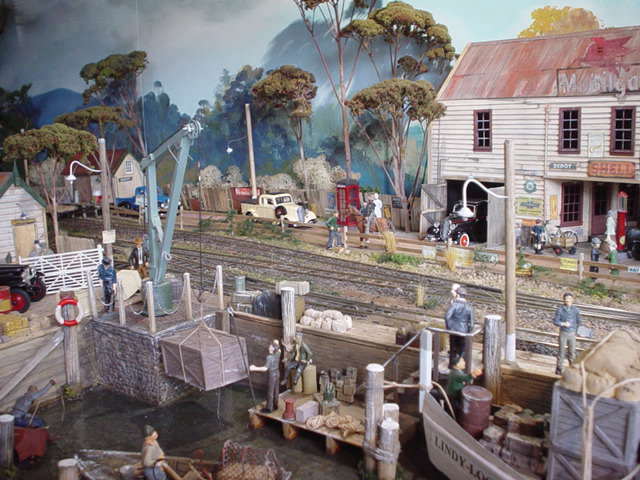 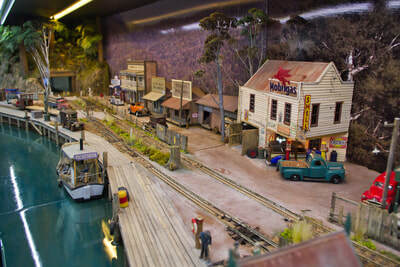 Mickleton is a freelance layout based on places and buildings around Victoria. 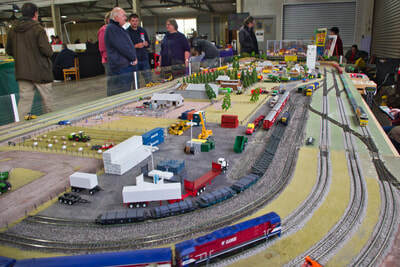 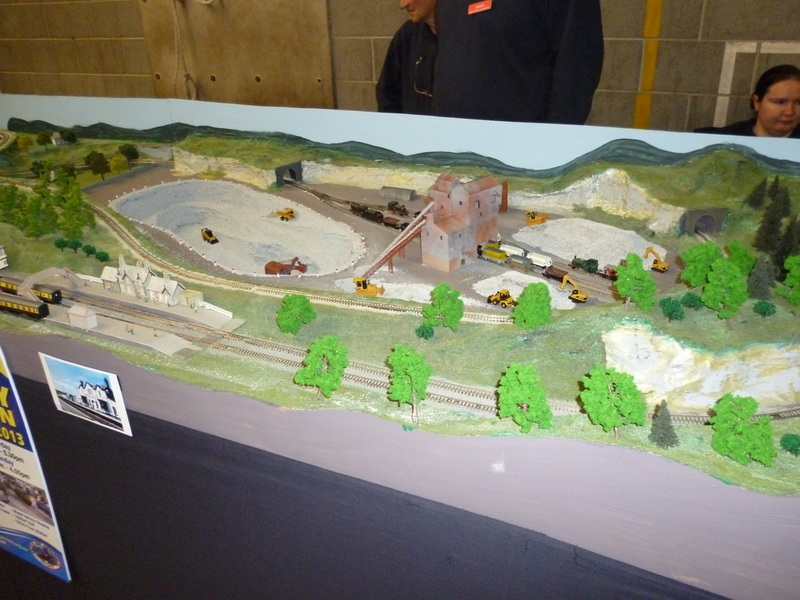 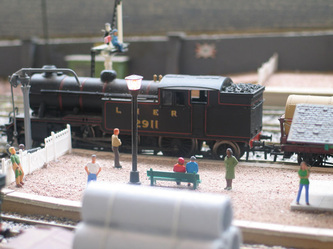 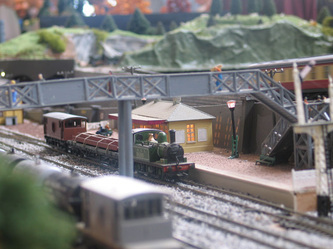 The layout has three mainlines running everything from Steam to Late Diesels and rolling stock. 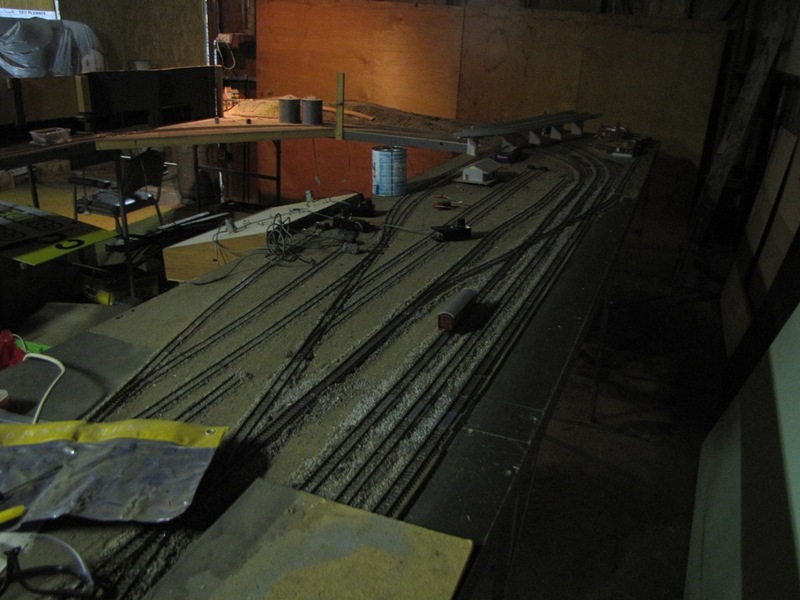 This layout is designed with a steel frame for easy handling, setup and transportation, with Peco track work and is DDC controlled. 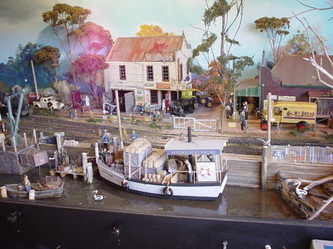 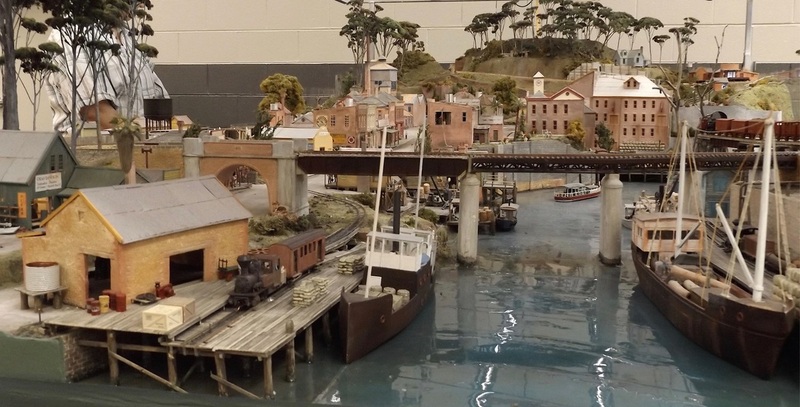 Port Franklin (what it could have been) as built with a touch of Modellers License! 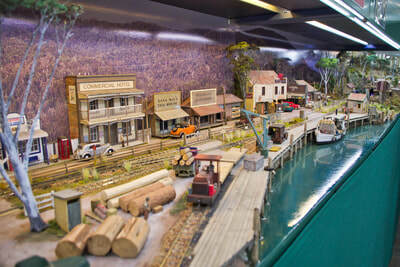 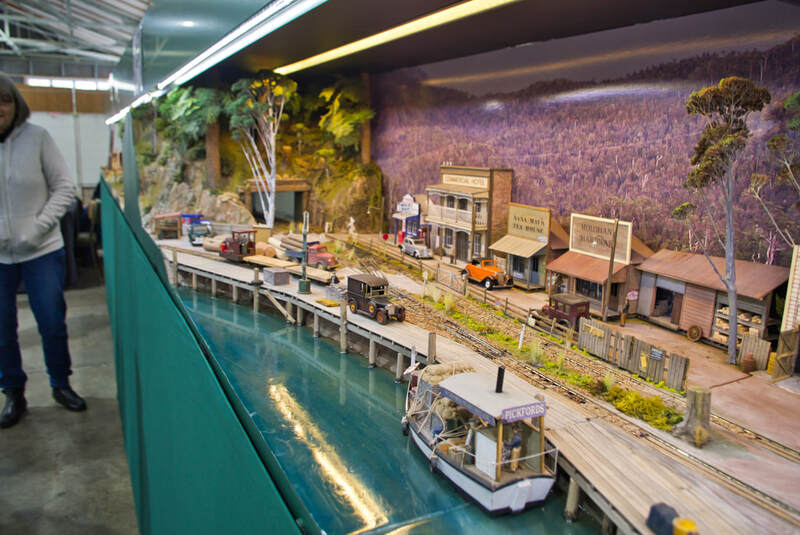 Modelled from original photos, plans and information of the tramways, trains and surroundings from all over Australia. 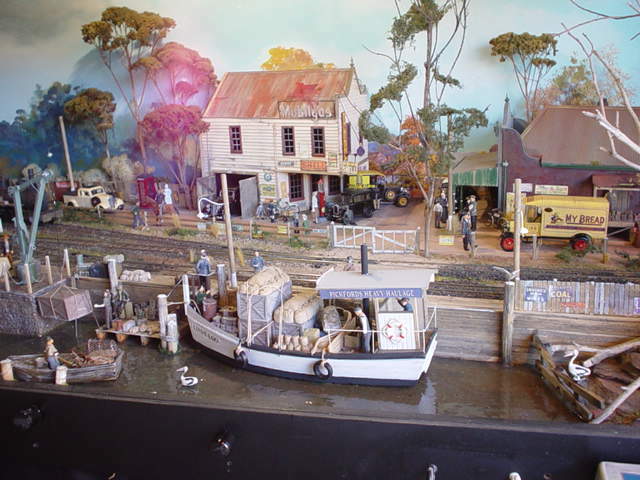 Franklin is situated on the banks of the Franklin River between Toora and Foster. scenic fibres mixtures. The carved Foam we found makes excellent rock formations. 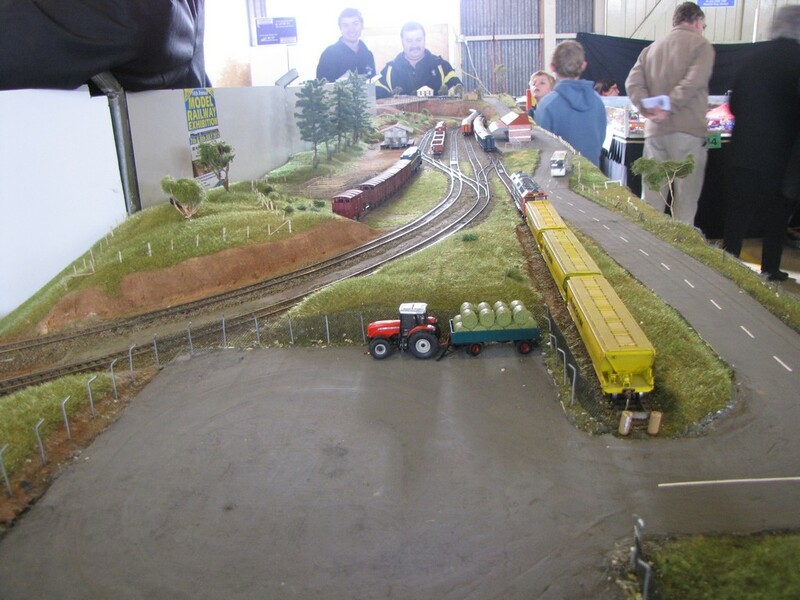 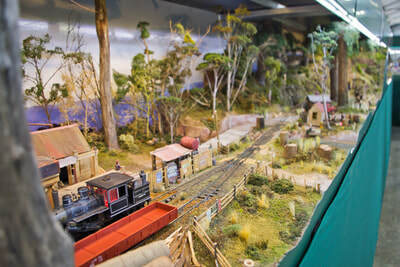 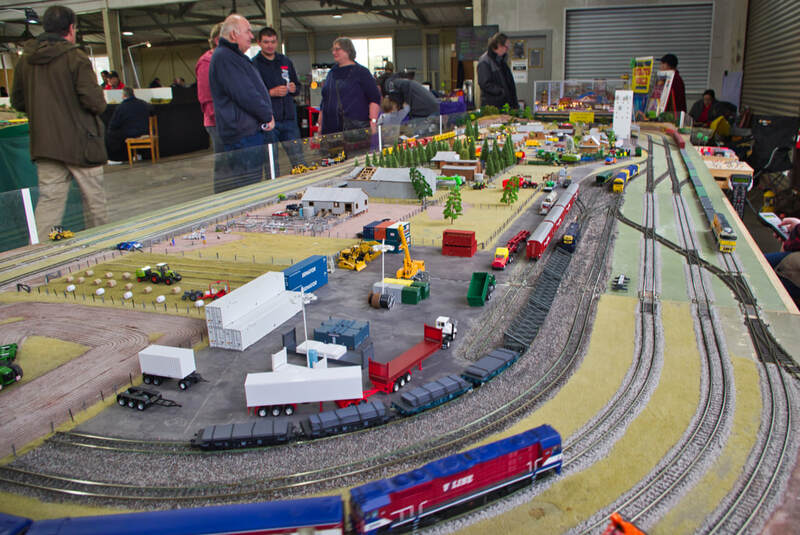 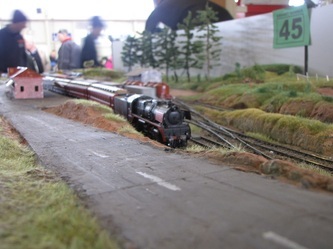 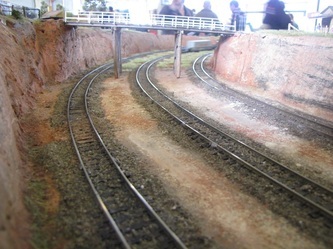 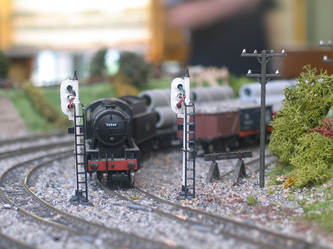 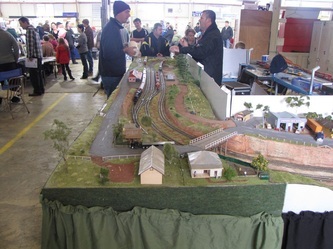 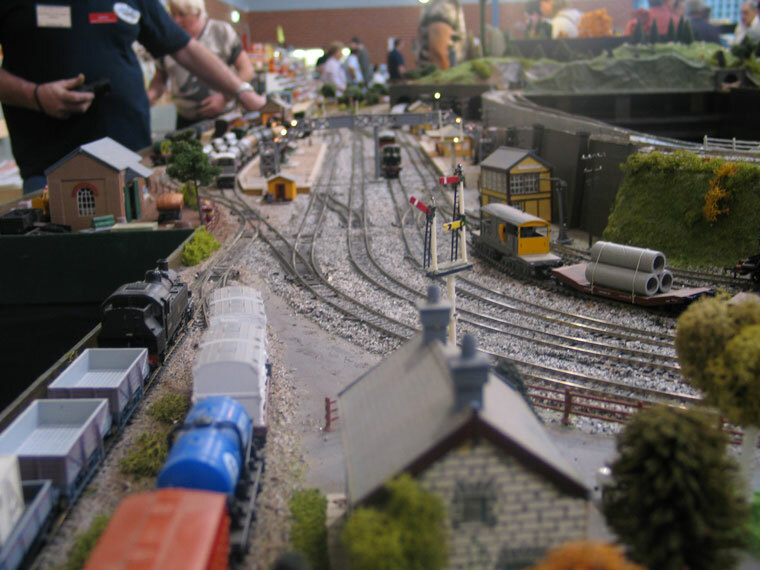 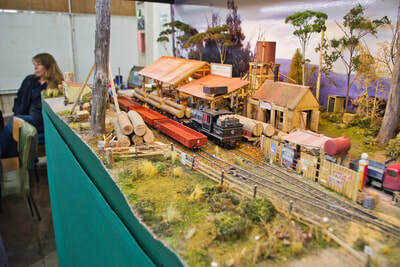 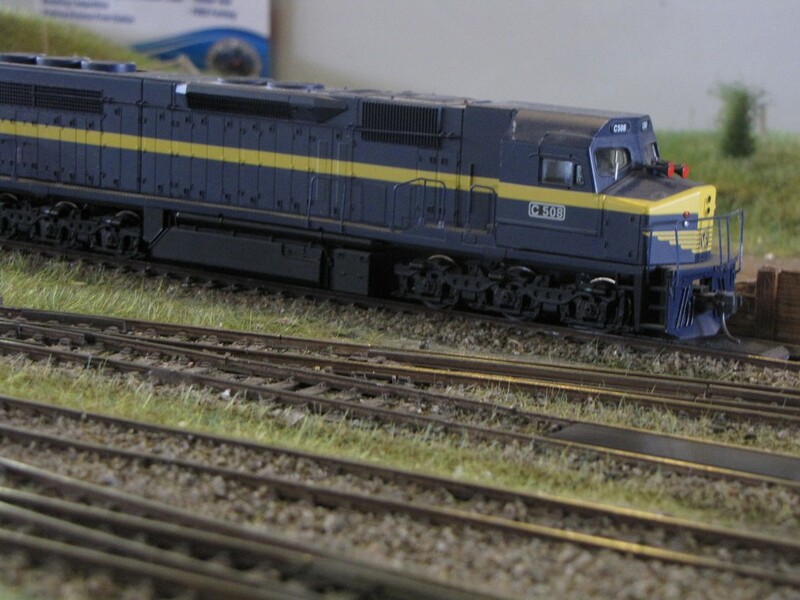 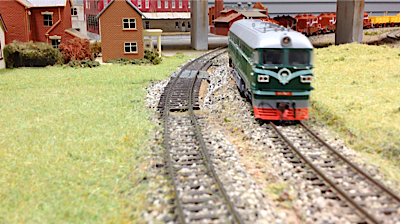 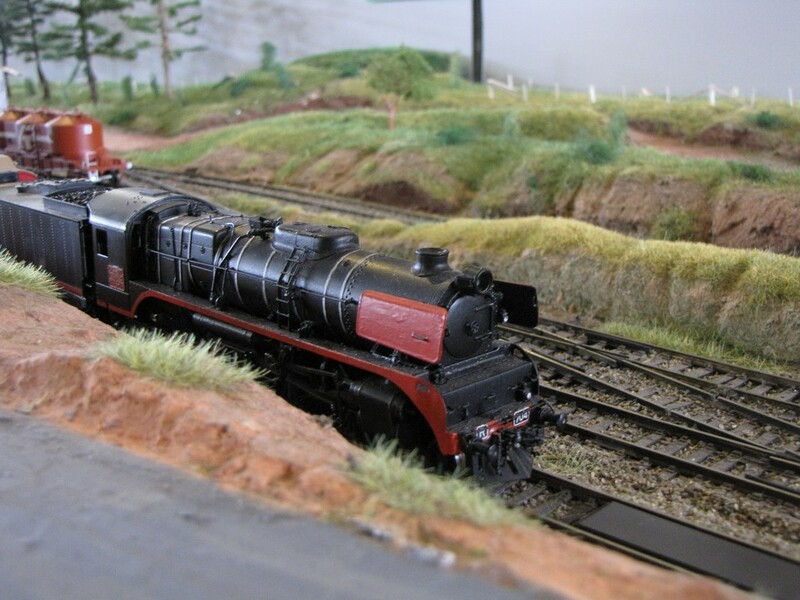 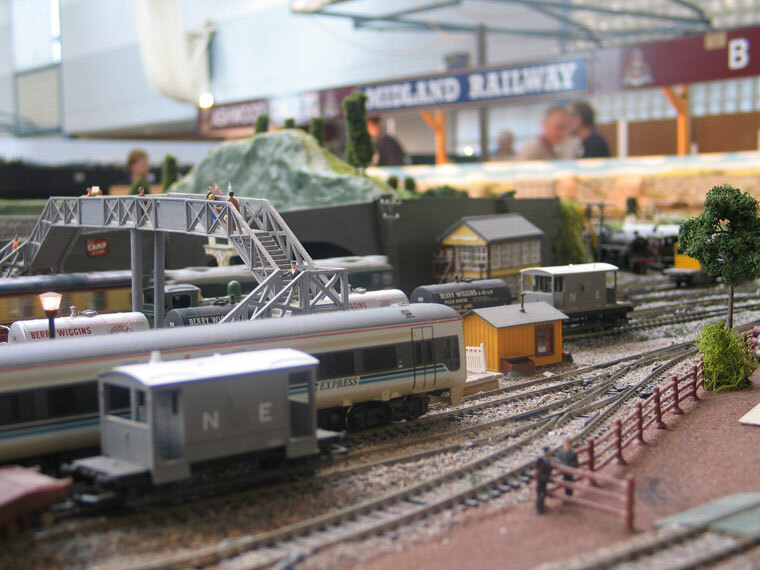 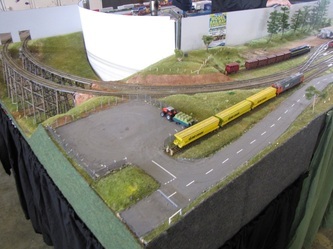 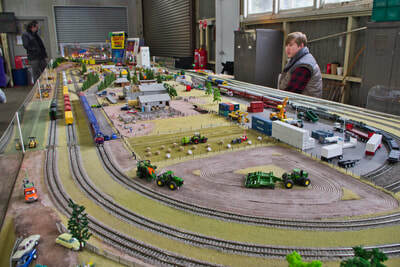 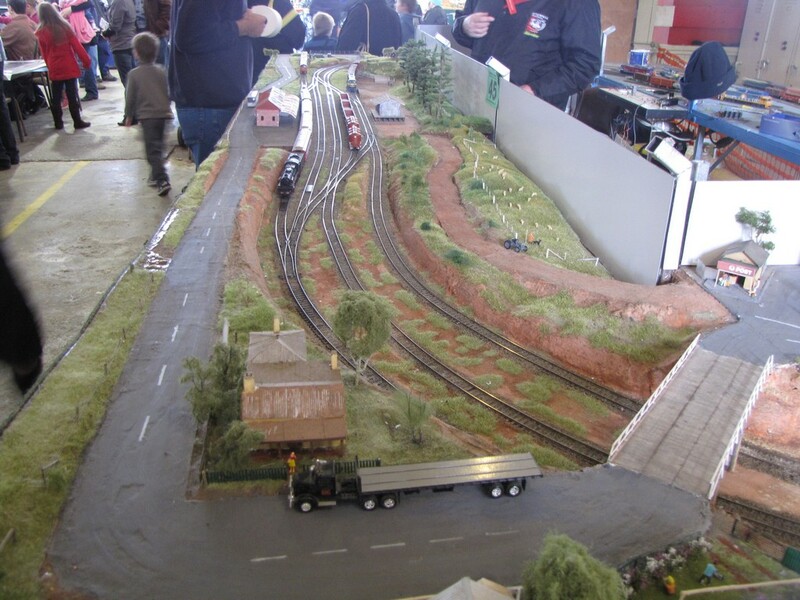 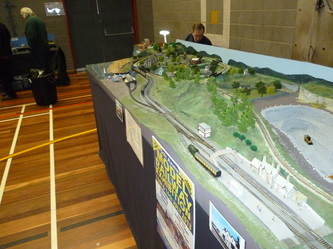 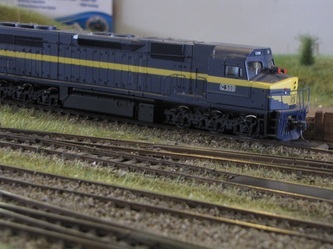 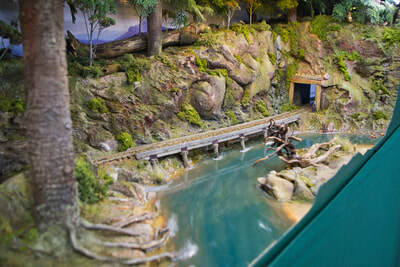 The layout is controlled by Heathcote Electronics Train Control Systems on DC power. 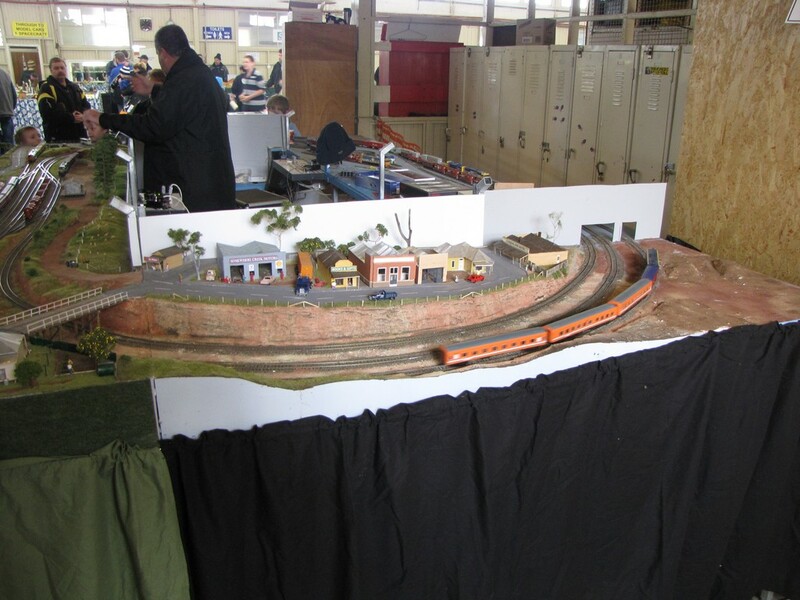 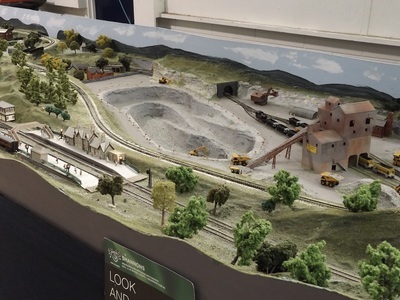 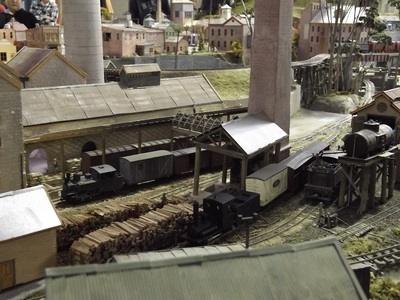 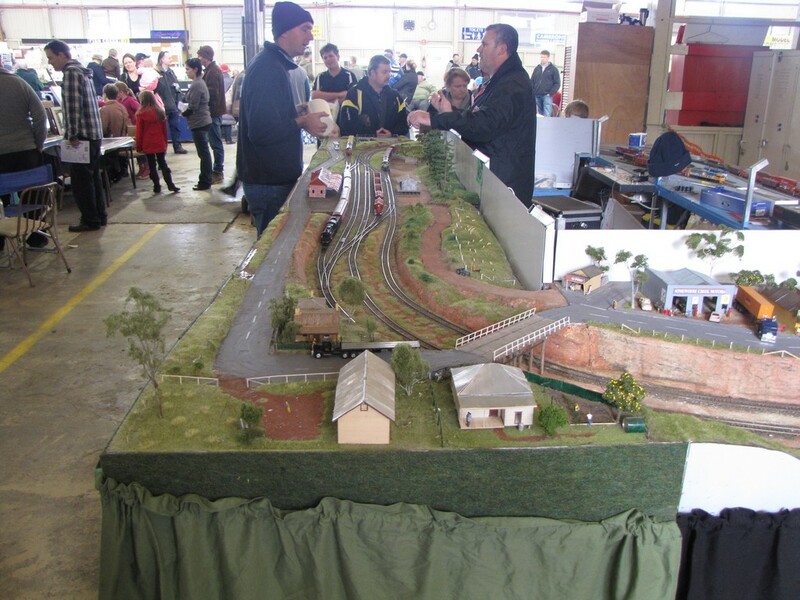 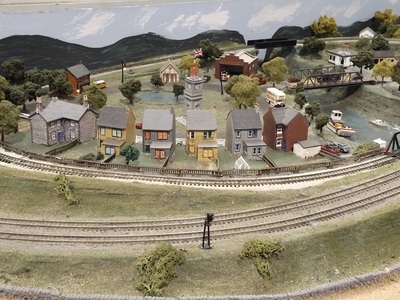 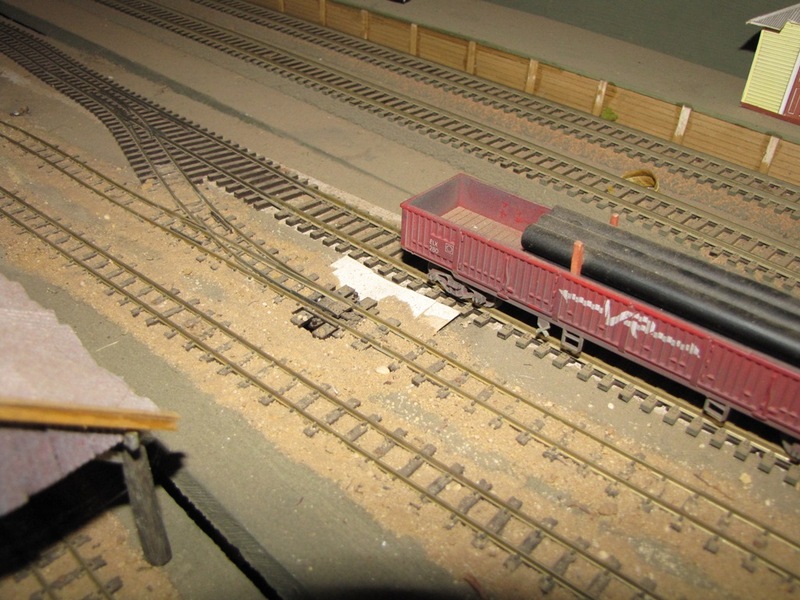 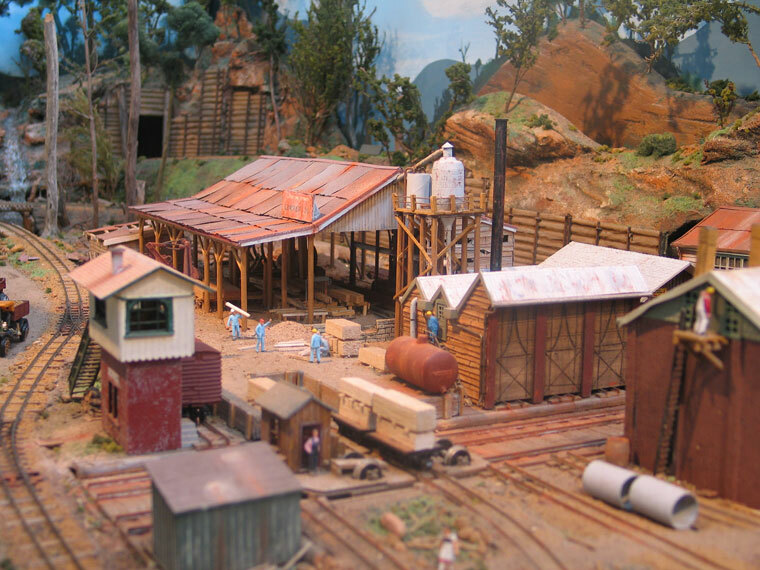 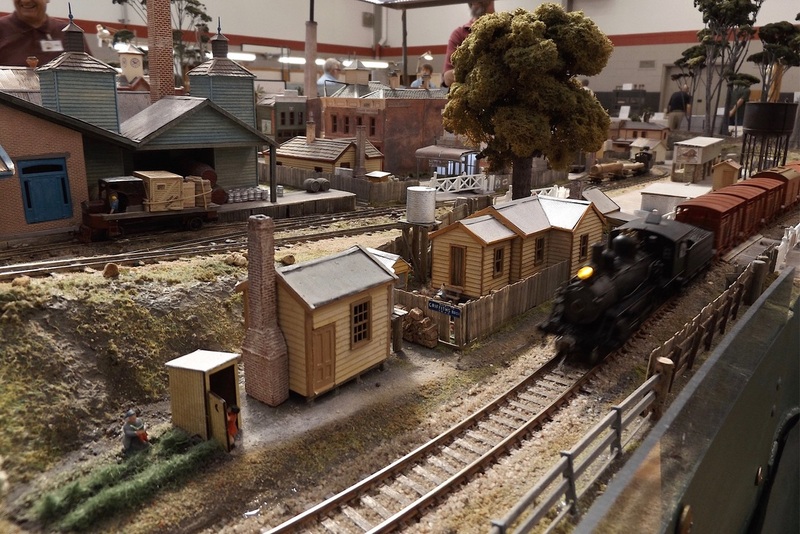 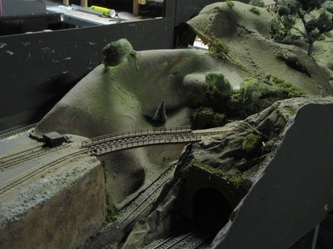 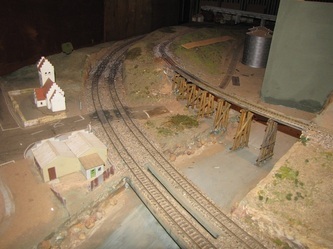 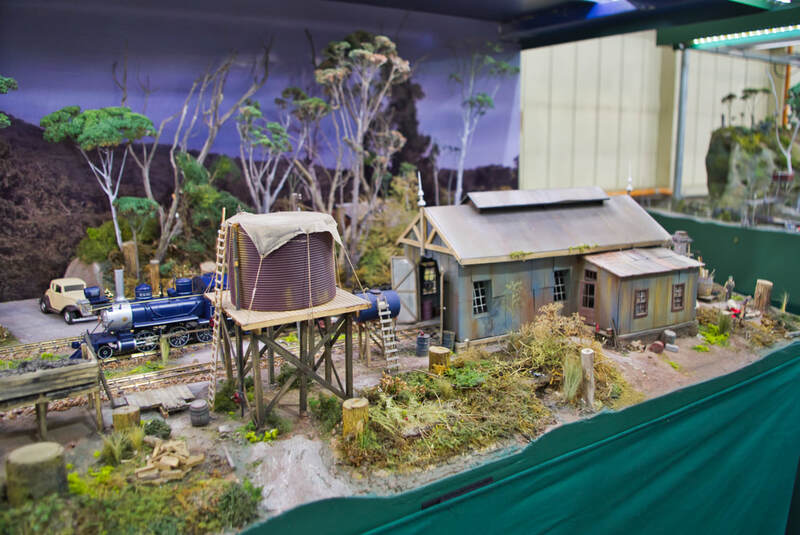 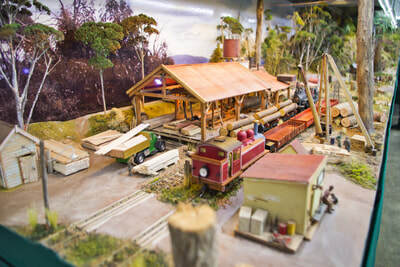 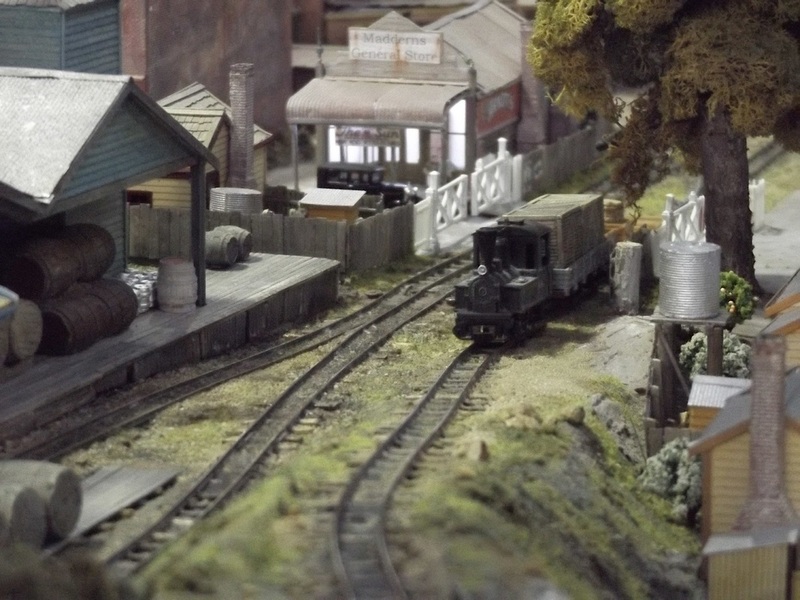 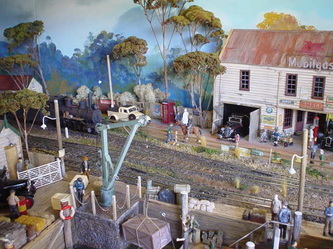 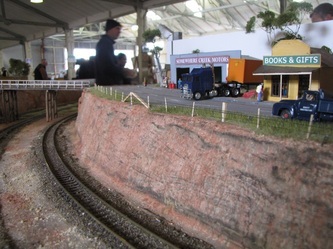 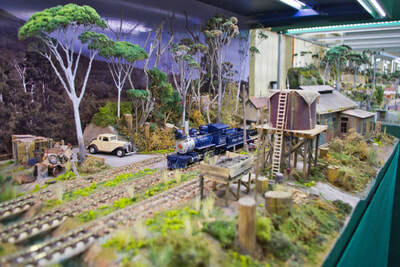 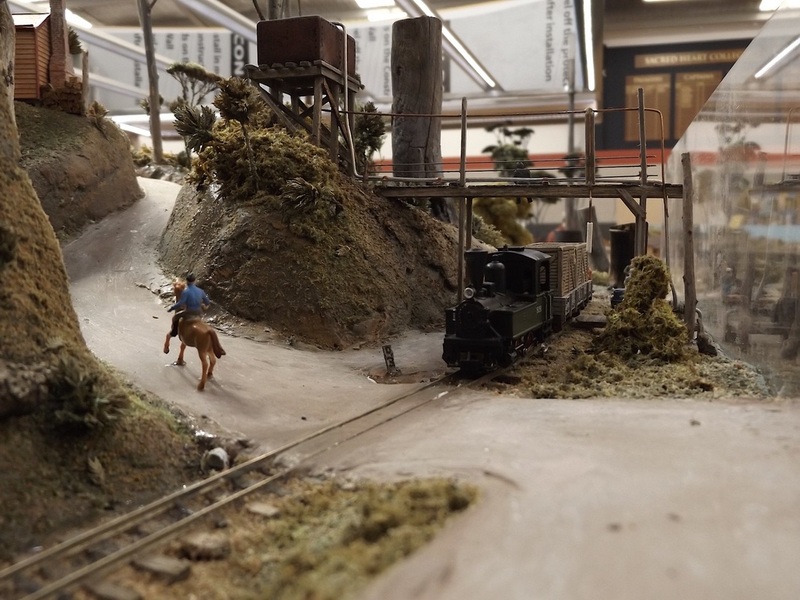 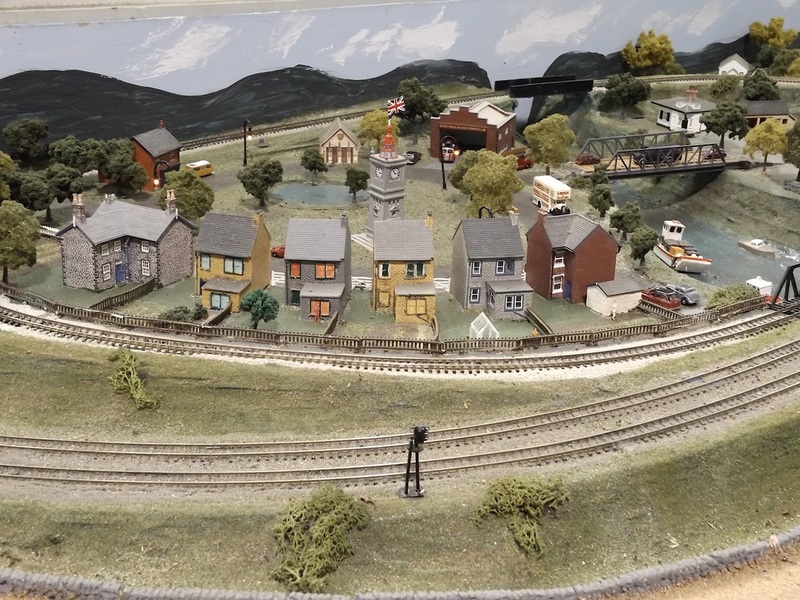 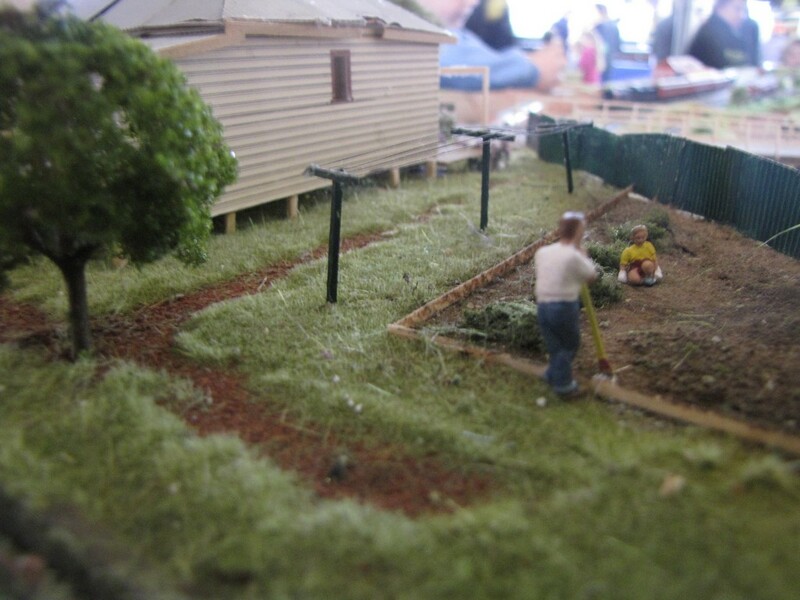 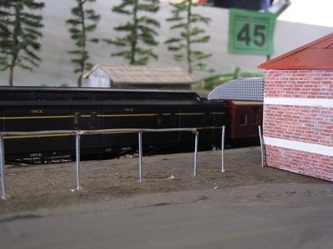 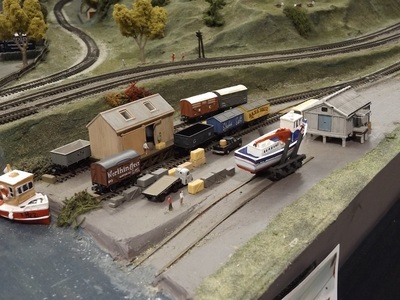 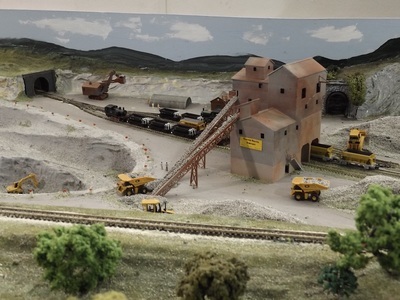 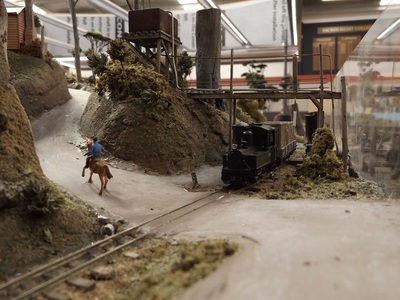 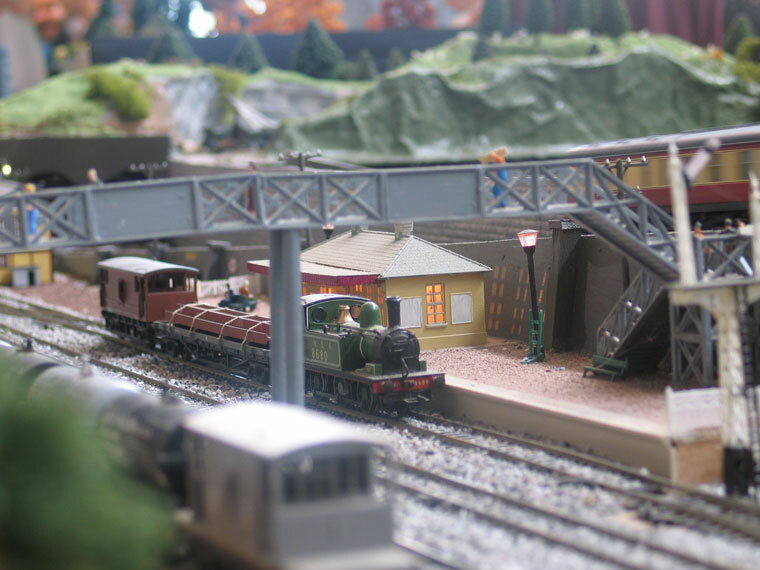 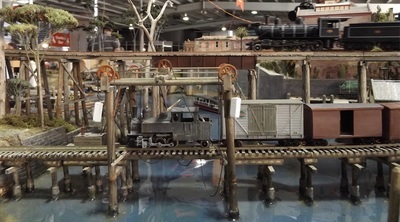 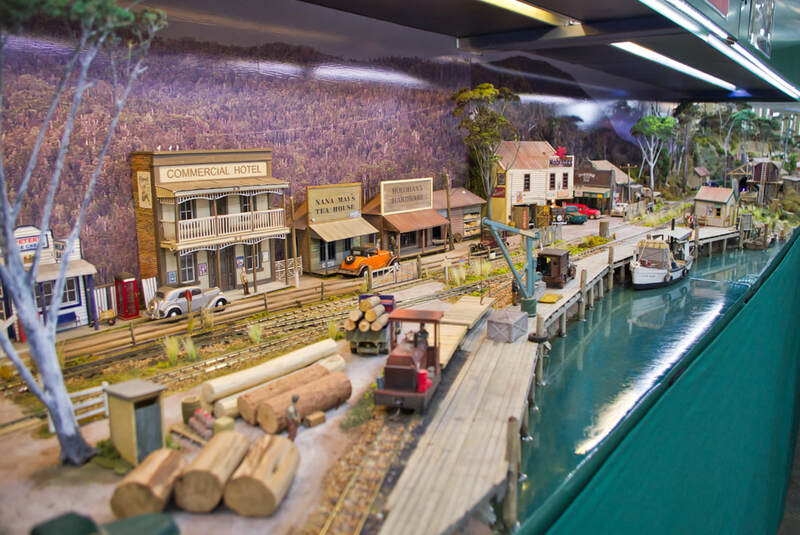 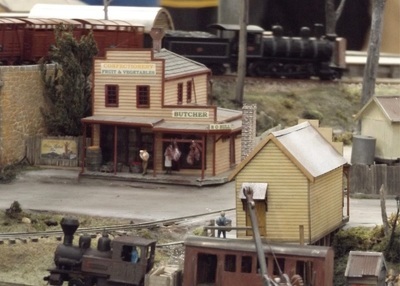 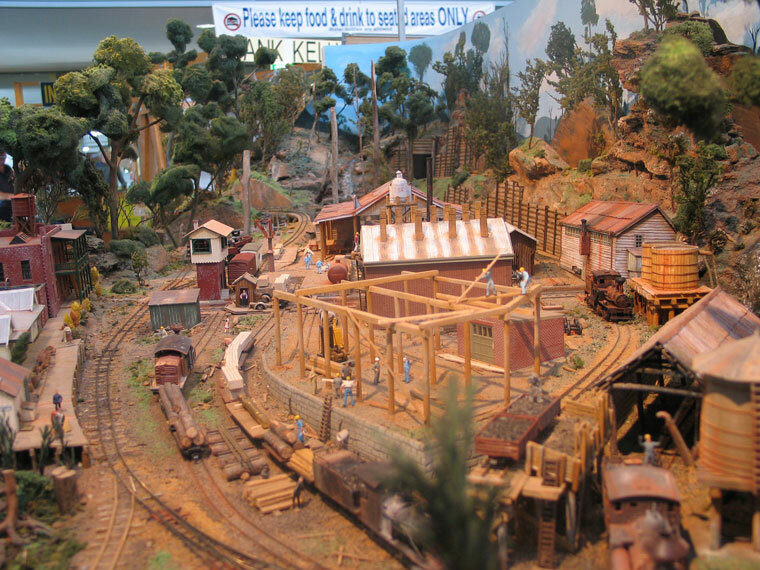 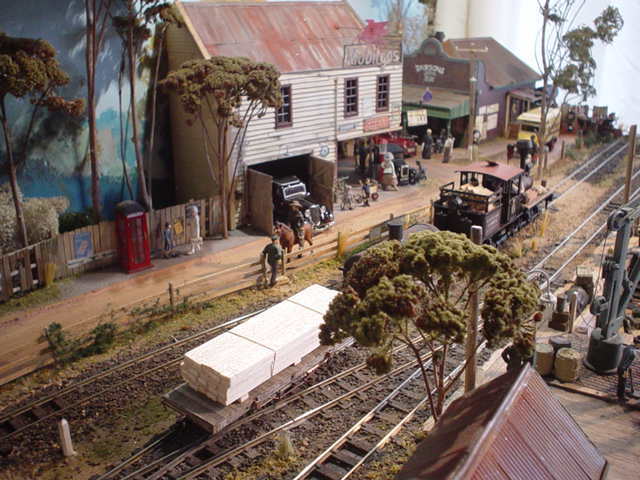 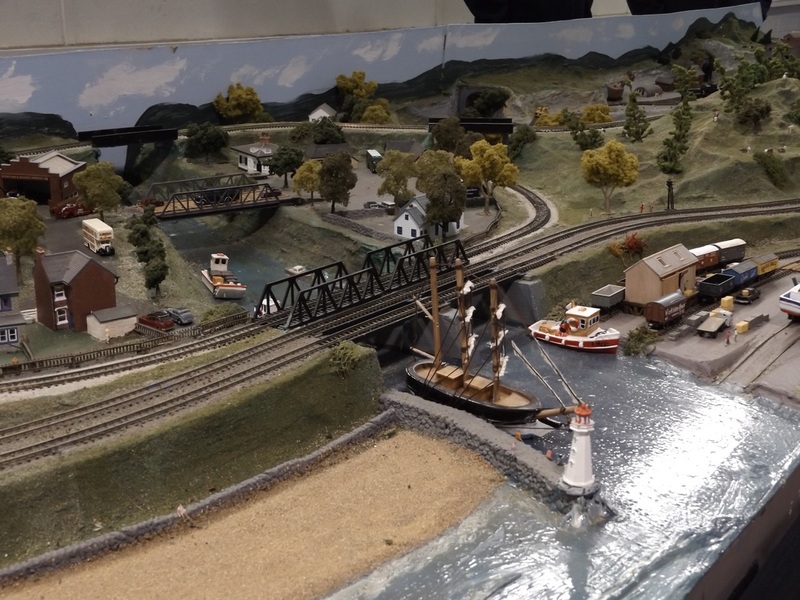 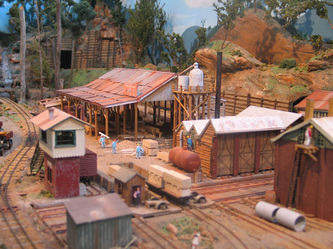 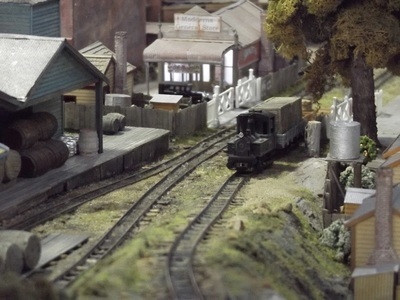 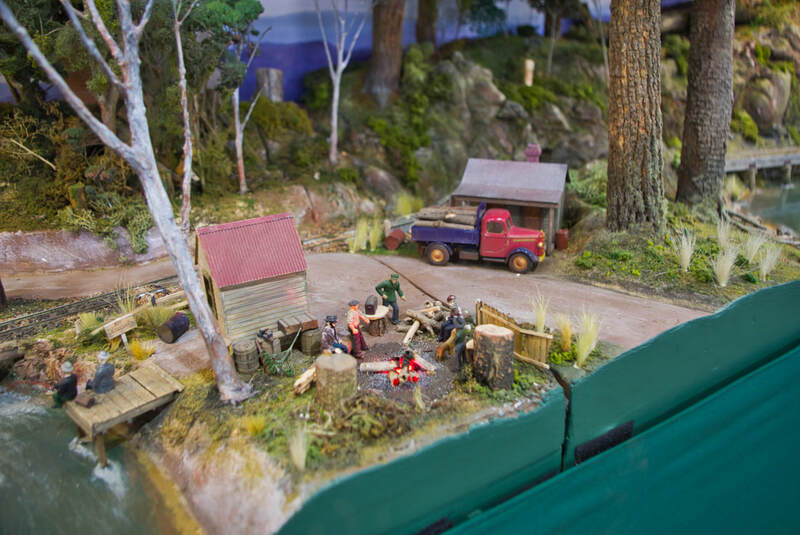 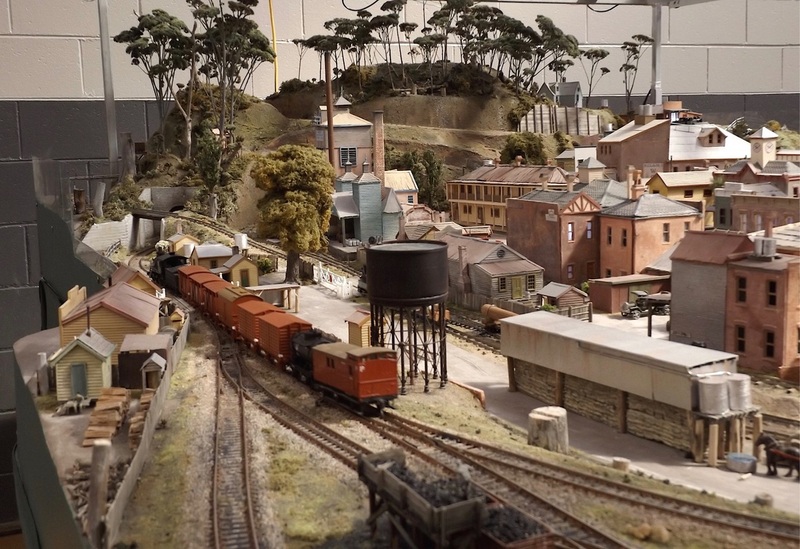 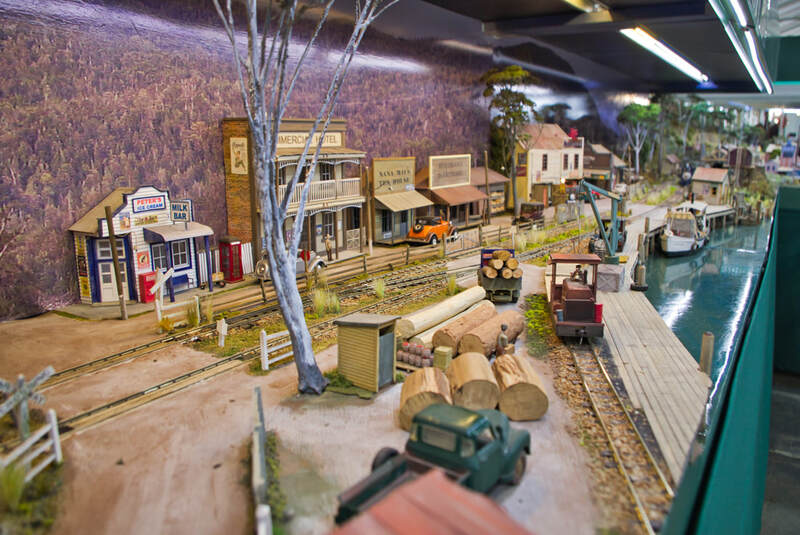 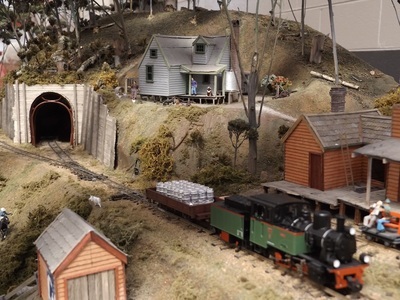 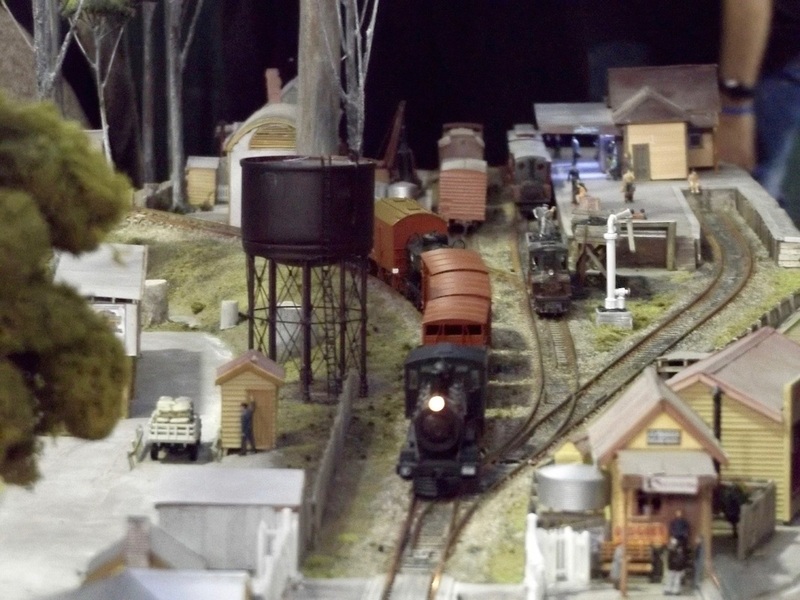 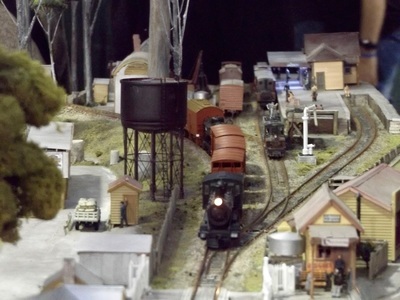 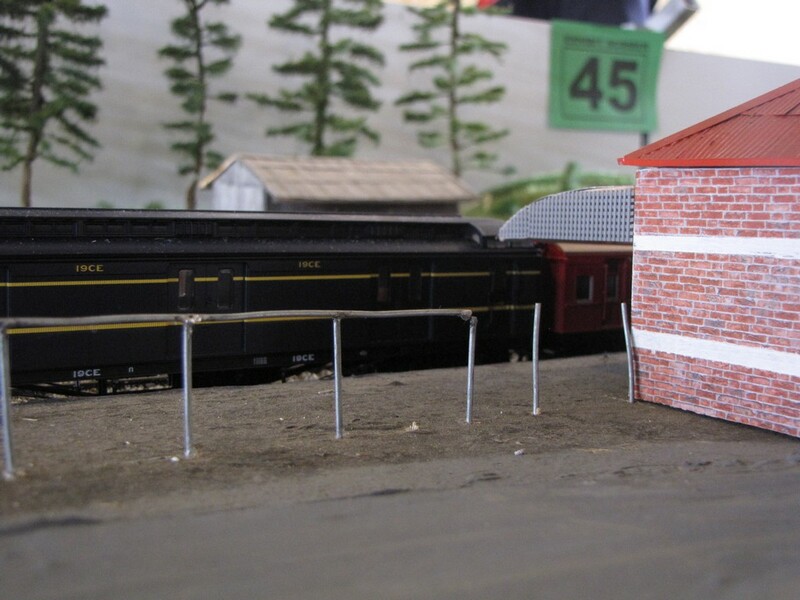 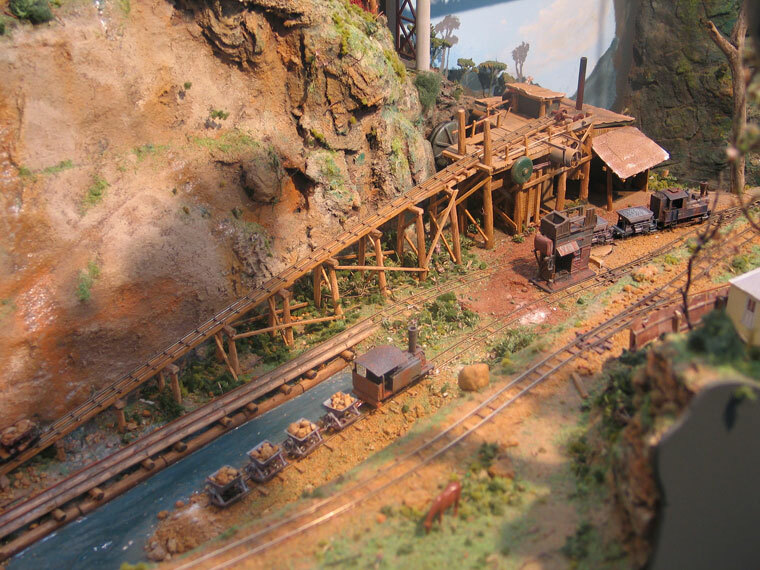 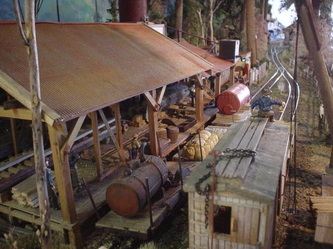 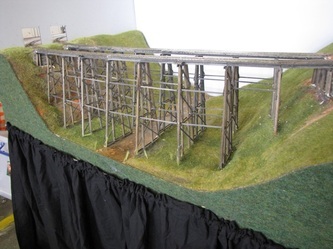 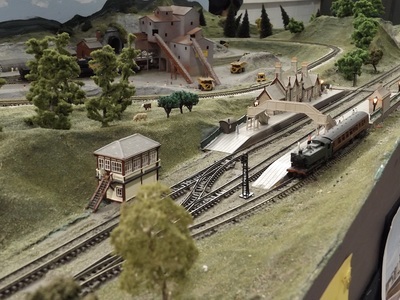 Club members have restored and utilised a lot of the buildings and the Saw Mill from the old Mount Ash layout that was original built by John Hunter, as well as scratch built and kit bashed others and a couple of Outback Model company kits. 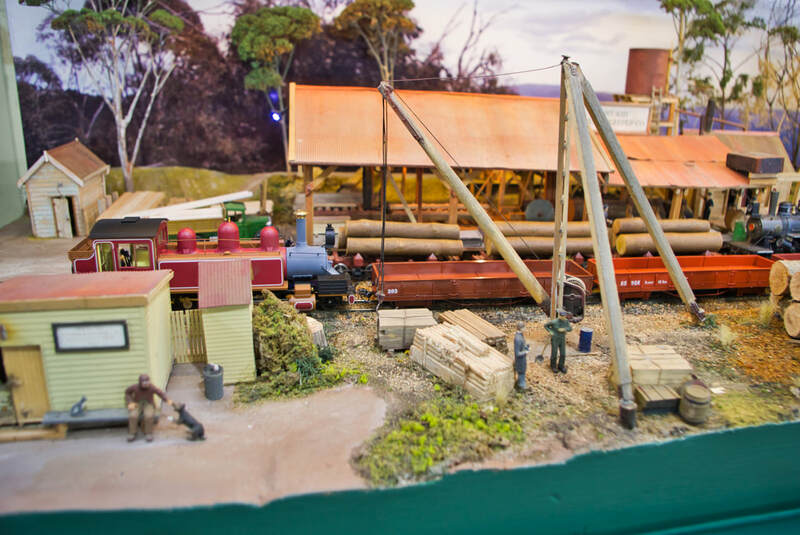 With Port Franklin set in the early to mid 1900’s, we have tried to obtain the feel of the life and times, that our pioneers faced in the rugged terrain to obtain the resources from the forests and development of rural communities into prosperity. 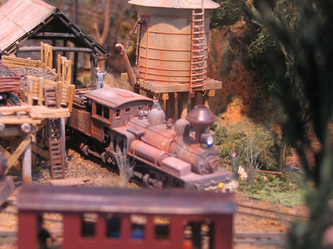 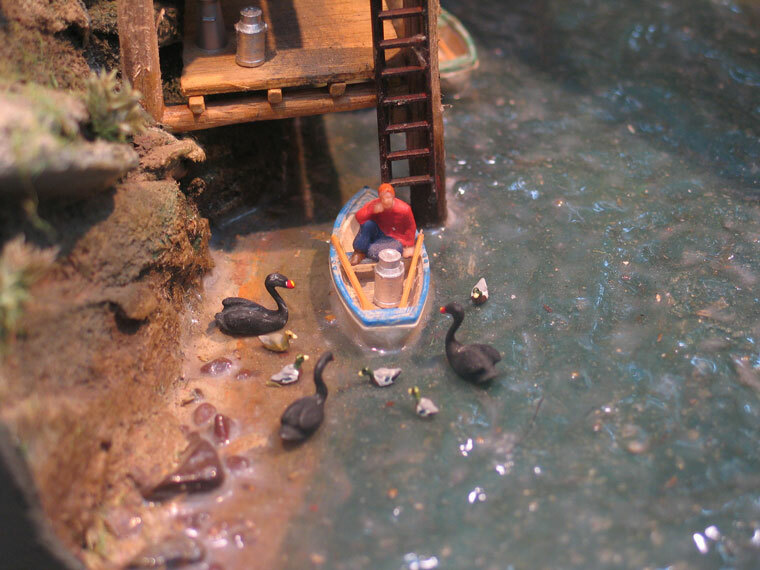 The little scenes throughout the layout all tell a part of this story. 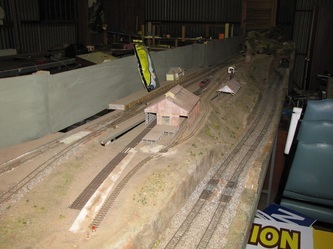 The 7.2 metres x 3.3 metres club layout is under construction, it has a large station, engine terminal, goods yard with branch line and industries. 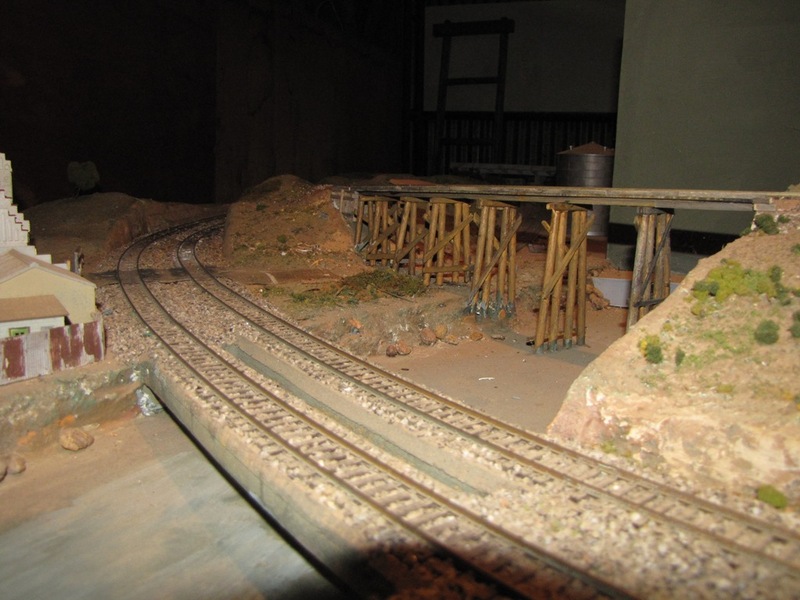 The branch line has a dual gauge station with a narrow gauge spur line supplying it with timber and stone. 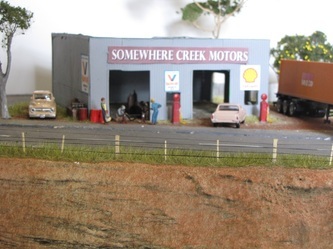 See the drop down menu above for Faller Cars @ GMR for more insights to our club layout. Sorry, they are not the best photos. 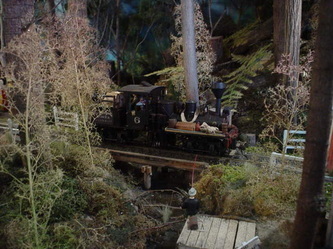 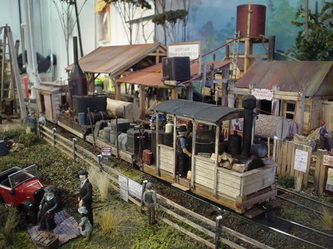 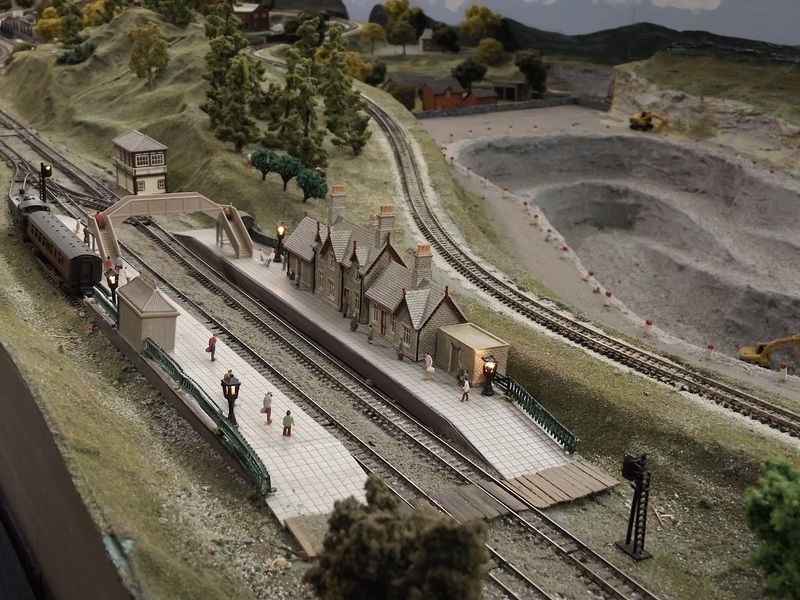 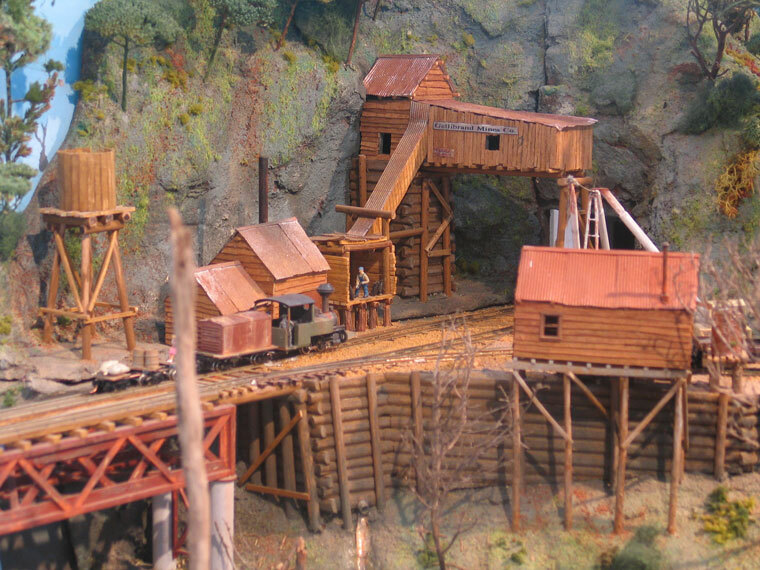 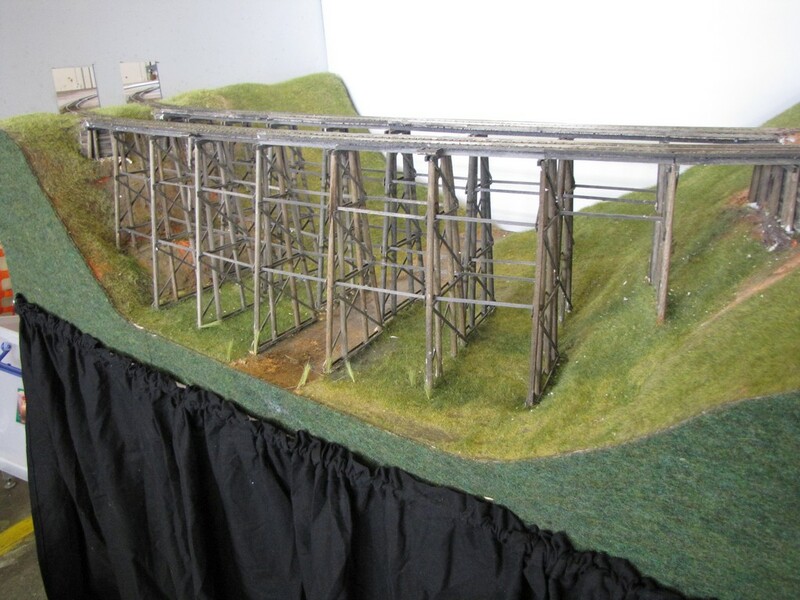 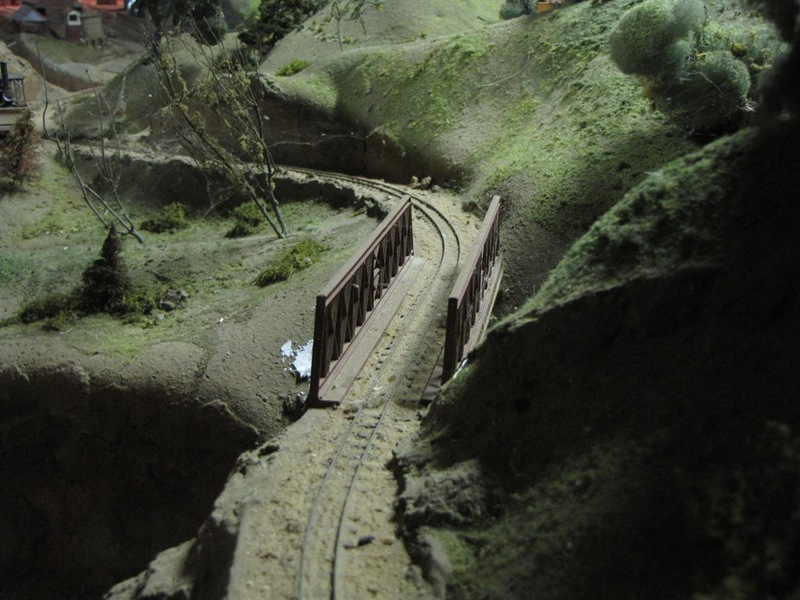 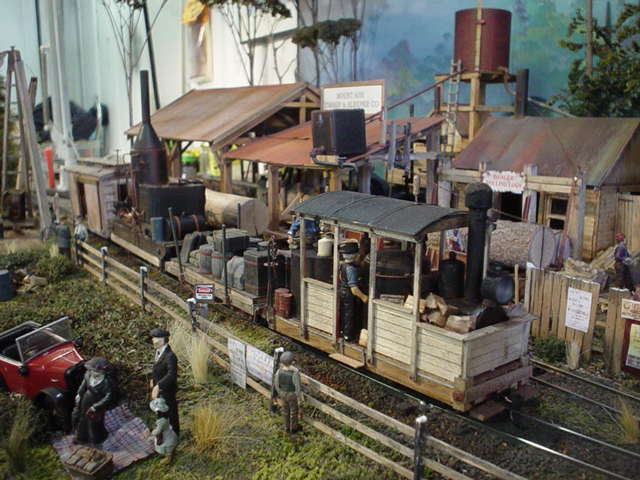 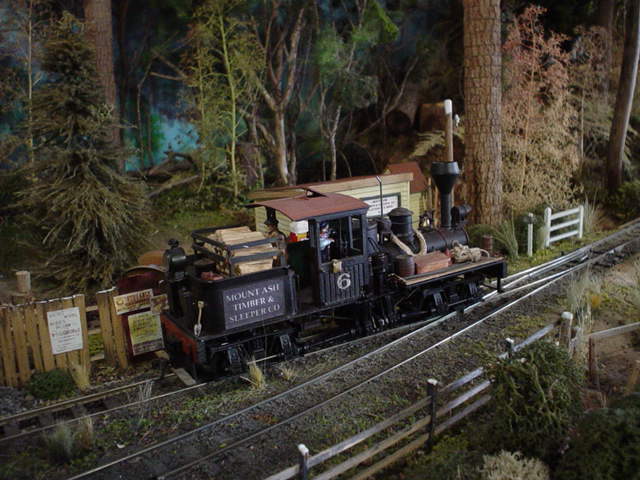 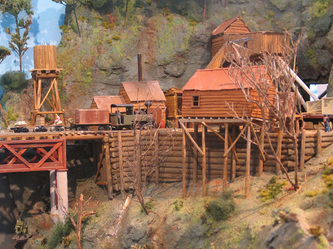 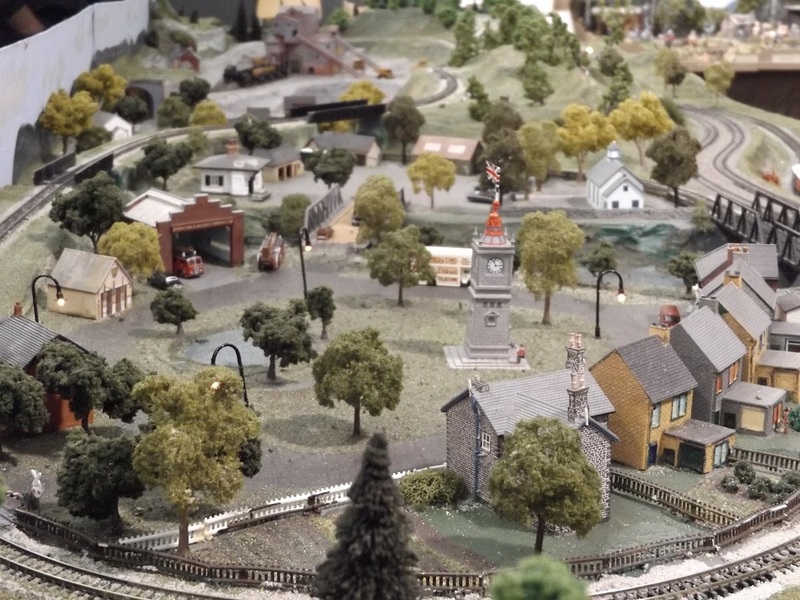 Powelltwon is a model displaying the rugged terrain in which the railways and tramways had to cover to extract the timber and raw materials to supply the complex mills and industry early last century. 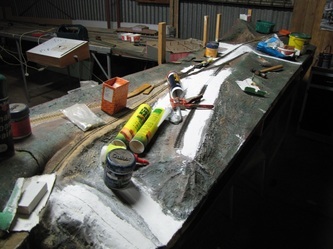 The scenery is made from canite, gap filler and paint base on L girder bench work, with addition of ground foams and fibers natural plants, twigs and soils. 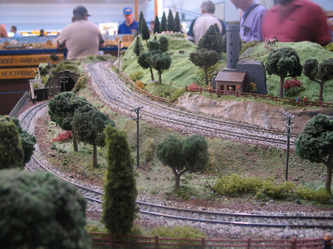 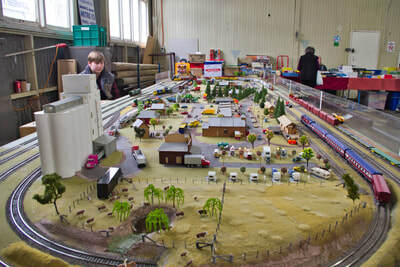 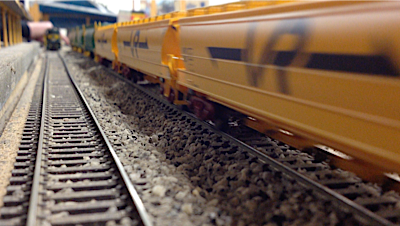 Most models and trains are scratch built. 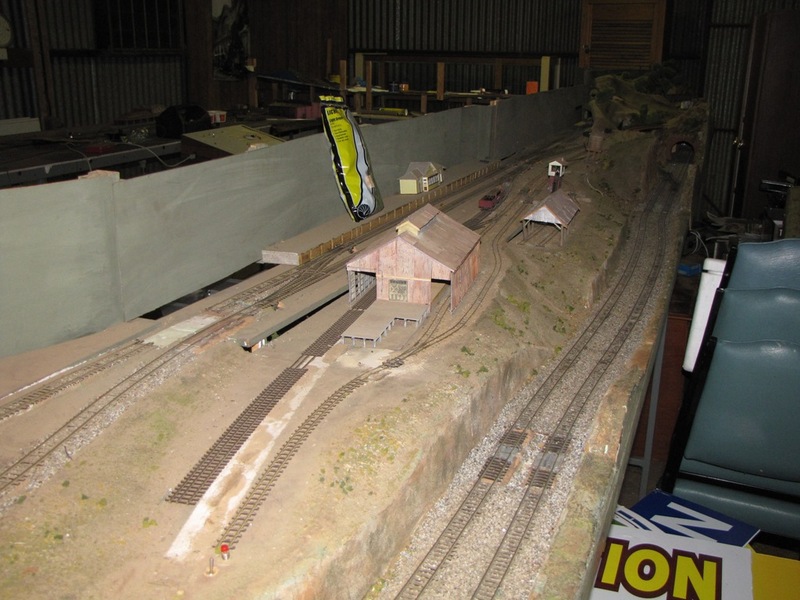 HO & narrow gauge freelance British in a rural setting with canal & lock gates. Catch a train at Burktown Station then change at Quarry Hill Halt to ride the narrow gauge to the old quarry. 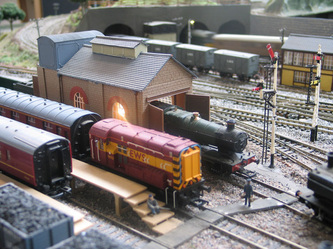 Afternoon tea at the Tower Tearooms. 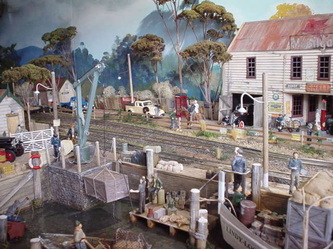 Colinsville By Colin Konig HOn2 1/2 scale - A fictitious river port Australian town with incredible detail and cameo scenes dotted throughout.